The Surface Contamination Kit provides a low cost, simple method of measuring the salt, pH, chloride and iron (ferrous ion) concentration on a test surface in accordance with ISO 8502-6. Measuring the level of contaminants on a surface prior to application of the coating will ensure the coating quality is at optimum level. The Surface Contamination Kit provides the means for testing invisible surface contaminants. It is low cost, portable and will give quick and easy measurements of surface contaminants. 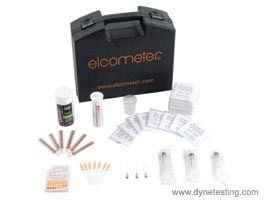 The kit is supplied with test strips to measure pH; Iron (ferrous ion); Chloride & Salt. Testing for: pH, Chloride ions, Iron and Salts.